So I decided I wanted to make Quiche this week. Why? because last time I tried I failed miserably AND I had an extra pie crust left in the freezer...yes I don't make my own yet I buy frozen... (Tenderflake - trust me they are the best. )Unfortunately I decided I like two different recipes and wanted to see if I could combine parts from both..the result was LOTS of quiche but it was VERY tasty! 1. Take the frozen pie crust out, and place it on the counter for 10-15 minutes while you get everything else out. 2. Preheat the oven to 375 F.
3. Prick the bottom of the pie crust with a fork (for those who don't know - like all over the place) and place it in the oven for 10 minutes. take it out when done and set aside. 4. Place a medium skillet on the stove over medium heat. While it is heating throw the bacon in the pan to crisp up and get warm. 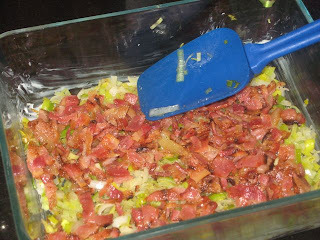 Once done remove the bacon, set it aside and drain any oil from the pan. 5. 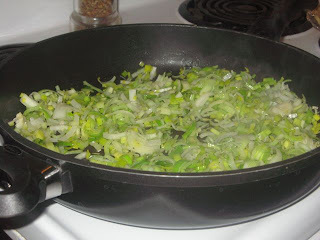 Throw the diced onion and leek into the skillet. Give them a good amount of salt and pepper. 6. Stir until nicely soft and almost caramelized. 7. In a bowl beat the 8 eggs and then add the milk, salt, pepper, nutmeg and then the finely grated cheddar cheese (we didn't finely grate it and I would suggest it would work better). 8. 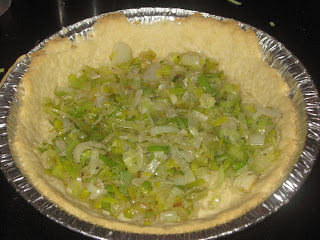 Now in the bottom of the pie crust add some bacon and the leek and onion mixture. 9. 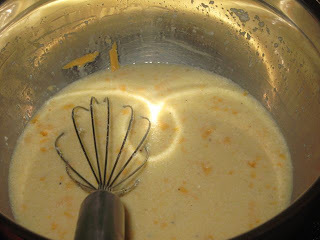 Add the egg mixture until it is almost at the top of the pie crust. 10. Place in the oven for about 40 minutes or until the center is firm. 11. Remove from the oven and let stand about 5 minutes before serving. Alternatives: leave out any bacon, or make it in a spring form pan so you can skip the crust and just make one larger dish. 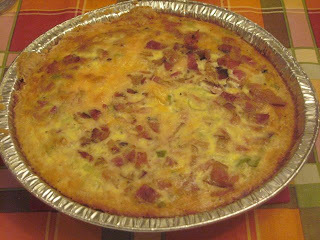 Final thoughts: Quiche is not a quick thing to make - so I would probably not do it again on a week night. However, I am told that it reheats really well - so it might be a good weekend make& save (meaning make it on a sunday and then use it during the week as a meal saver).